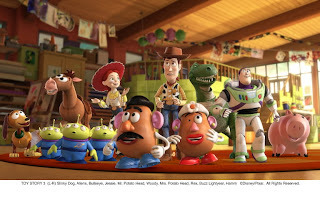 According to Access Hollywood, Toy Story 3 became the #1 movie with $109 million grossed after its opening weekend, topping The Karate Kid, which has now made $106 million total. With these sales, Toy Story 3 became the best debut for a film from Disney’s Pixar Animation, topping The Incredibles at $70.5 million. The movie took in an additional $44.8 million overseas, giving it a worldwide total of $153.8 million. Well....congrats Disney-Pixar. Apparently, the plot was good enough to still keep people interested after 11 years. Maybe I will go see it...probably not though lol. So in looking at the list of movies that Disney made on Wikipedia, I found out that they are also making sequels to Cars and Monsters Inc.!!! Again, years after the fact, but hey, I actually really liked those movies so that would be cool to see. Also Disney, for your consideration, if you're going to start doing all of these sequels, can you think about doing one for The Incredibles and Ratatouille? The kid in me would appreciate it.